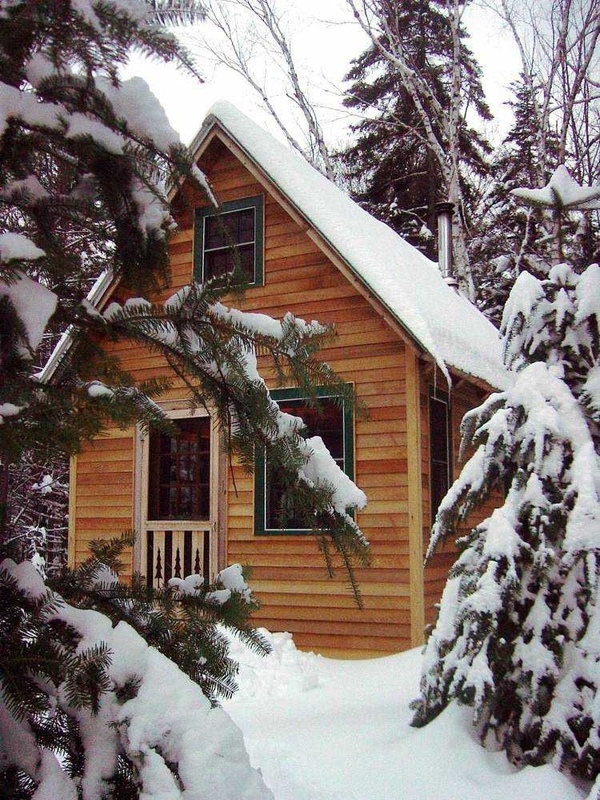 The cabin is headquarters for NY Ski Blog. It’s a small, rustic camp, up high in a big woods in North River, NY. People use the terms “rustic” and “camp” rather loosely in our opinion. HQ really does fit that definition. It’s designed to serve as a ski cabin that we can afford. It’s heated with wood and really costs us almost nothing, when you compare it to ski gear, lift tickets, gas, food and all that other stuff. 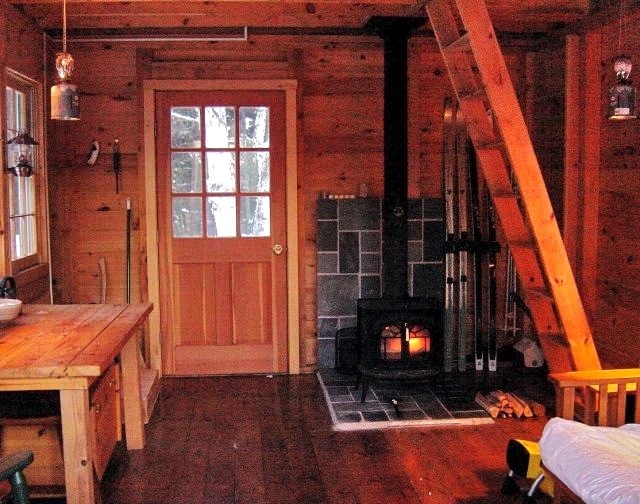 The cabin was built in 2001 by Rand Fosdick of Chestertown. He and I drew it on a napkin one winter night at Garnet Hill Lodge over drinks. The building is 12′ x 18 — it’s one room with a tiny loft. It sports the smallest Vermont Castings woodstove, the Intrepid II. While the stove is rated to heat up to 800 square feet, we find we need everything she can put out, as we leave no heat on when we are gone. At times we are heating the building up from as cold as 20 degrees below zero when we arrive. In 2004, we were considering adding a generator, but determined that in the long run, being on the grid would be cheaper, easier, quieter and much more environmentally responsible. We dug a 500-foot trench from the road and ran a cable capable of handling a 200 amp service, and a phone line. We added an electrical panel and ran two 15 amp circuits inside. Having real, adequate light for reading and writing our reports felt downright civilized. In 2005, we did another major upgrade. Our (very) long range plan is to build a proper house on the site capable of handling all the NY Ski Bloggers, family and friends. The cabin would serve as a guest house or an art studio. On the spot where the house would be positioned, we constructed an even smaller building. It’s a 9′ x 12′ structure built on skids, with no true foundation. The carpentry was done by Mike Hill Construction of Schroon Lake, the excavation and septic was done by Ernie Clark of Igerna, and the well-drilling was done by Garry Wolfe of Wevertown. The newer building serves a variety of functions. From a site planning point of view it’s a utility head. We drilled a well, installed a septic large enough to handle a year-round three-bedroom house and connected the building to the 200 amp electrical panel. When the time is right, we’ll disconnect the utilities, drag this building aside and start work on our bigger building. The new building — Zelda calls it the “spa” — has a shower, with an on-demand tankless hot water heater, a toilet, a sink, a few cabinets and a small refrigerator. We leave it heated from Thanksgiving to Easter, set at about 50 degrees. It’s so small inside that it’s impossible to take a picture of the interior that actually shows the room. In the summer of 2010 we upgraded the spa’s heat and hot water system to ultra-efficient propane system. We bought twice as much propane tank as we thought we’d need, as there is no easy way to get the propane delivery truck up the driveway in the winter or spring. We fill those tanks once each year in the fall when the driveway is solid and dry. During the winter of 2010-2011, the performance of our propane system was astonishing. We used $148 of fuel for heat and hot water for the entire year. In January of 2014, after a skiing the backcountry with former DEC Ranger and friend Steve Ovitt, we discussed the possibility of developing trails at HQ. In the summer of 2014, we employed the services of Steve’s company Wilderness Property Management to develop a 9000-foot trail network for nordic skiing, mountain biking and walking right out the back door.